Crown and Bridge: When your tooth is structurally compromised, then full coverage protection is needed. This is done by placing a crown on the tooth to prevent it from breaking apart and holding the remaining portions of your tooth together. Crowns can also be used to restore a severely worn tooth, to cover and support a tooth with a large filling when there isn’t a lot of tooth left, to hold a dental bridge in place, to cover mishapened or severely discolored teeth, and for cosmetic modifications. There are many types of crowns: gold crowns, porcelain-fused-to-metal crowns, and all ceramic crowns. Your prosthodontist will discuss with you which type of crown is recommended for you based on location in the mouth, your bite-forces, and esthetics. The process typically takes about two visits. On the first visit, the tooth is prepared and you will go home with a custom made acrylic temporary. You will need to avoid sticky, chewy foods, minimize the use of the side of your mouth with the temporary, and avoid chewing hard foods (such as raw vegetables). When flossing, slide the floss to the side and out, rather than lifting up the temporary. At the second visit, your prosthodontist will remove the temporary crown and check the fit and color of the now permanent crown. If everything is acceptable, the new crown is permanently cemented in place and the bite rechecked again. If you are missing one or more teeth, a bridge may be an option for you. 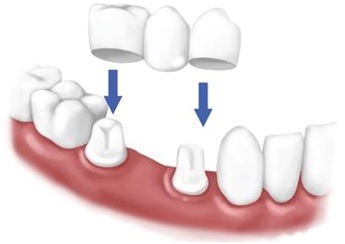 A fixed bridge replaces one or more teeth by placing a crown on the tooth located on either side of the space and attaching artificial teeth to fill the space. This “bridge” is then cemented into place. Not only does a bridge fill in the spaces created by missing teeth, it prevents other teeth from shifting position. Bridges are a great way to restore your dental health and appearance by filling in where teeth are missing.